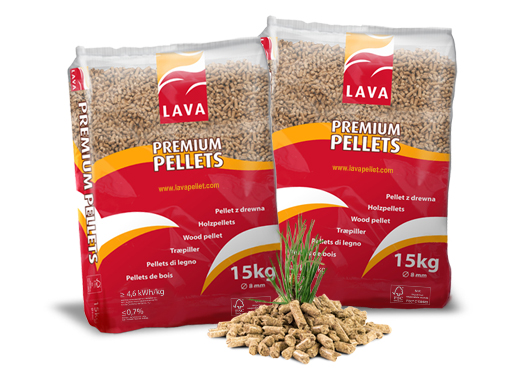 LAVA pellets are defined by their high qualitywhich we can guarantee through the use of our own sawdust in the manufacturing process. We have full control over our sawdust quality and composition. The pellets are manufactured only from the use of sawdust from coniferous trees (pine, spruce) which is characterized by a high level of cohesiveness, and the pellets made from it are of a bright colour. The previously used drying drum, with a drying temperature of approx. 400°C, has been replaced by a state of the art belt dryerwith a drying temperature of up to 100°C. Result: the partial burning of the pellet material, and its contamination with soot or flue gases is avoided. The binder is not burned out and this facilitates the process of granulation. LAVA pellets are environmentally friendly – CO2 emissions during combustion are equal to the amount of CO2 absorbed by a tree during its growth, which means that no additional CO2 is released. Regular checks maintain the high quality of our products which is guaranteed by the FSC standard. LAVA pellets are offered in standard-sized bags of 15 kg. PLEASE NOTE: During transport and storage the product should be protected from moisture. Use after unpacking, only in equipment intended for the stated purpose.